May 14, 2009 — Students at YU’s 78th Commencement Ceremony at Madison Square Garden’s WaMu Theater on May 14 received a send-off from someone they know well: Dr. David Shatz ’65YH, ’69Y, ‘72R, ‘72BR, the highly popular professor of philosophy at Stern College for Women. 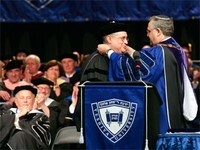 The esteemed scholar of general and Jewish philosophy gave the commencement address and was awarded the Presidential Medallion, the highest honor bestowed on a member of the faculty or administration for excellent service. Read President Joel’s addresses to the class of 2009 concerning the need for respect and responsibility. Shatz is the editor of the Torah u-Madda Journal and has edited or authored 12 books and published over 60 articles and reviews. He was ordained at YU’s Rabbi Isaac Elchanan Theological Seminary before earning his PhD with distinction in general philosophy from Columbia University. This year’s honorary degree recipients were Rabbi Dr. Jacob Haberman, founder of real estate ownership and management company Haberman & Haberman; Sylvia Axelrod Herskowitz, former director of the YU Museum; Rabbi Fabian Schonfeld of Young Israel of Kew Garden Hills, New York; and Lin-Manuel Miranda, creator and star of Broadway hit In the Heights. As museum director, Herskowitz worked closely with philanthropist and benefactor Erica Jesselson to give it a special identity, shaping it as a teaching museum that would collect, interpret and exhibit the art, artifacts and material culture of Jews the world over. Over the years the YU Museum has become a magnet for Jewish artists from New York, Israel and around the world. At the age of 29, Miranda is the youngest person to receive an honorary degree from the University. The gifted young playwright composed the score and starred in the hit play In the Heights, which won four Tony Awards and a Grammy Award for Best Musical Show album. Born and raised in a close-knit Puerto Rican family in Washington Heights, he captured and celebrated the vibrancy and diversity of the neighborhood that is also home to YU’s Wilf Campus. More than 2,000 graduate students in the fields of law, medicine, social work, education, Jewish studies and psychology, as well as undergraduate students from Yeshiva College, Stern College for Women and Sy Syms School of Business, are being awarded degrees this commencement season.